I built my own drawers but it would be really cute and even easier if you could snag a few vintage drawers! I built these with scrap 1×4 and 1×6. 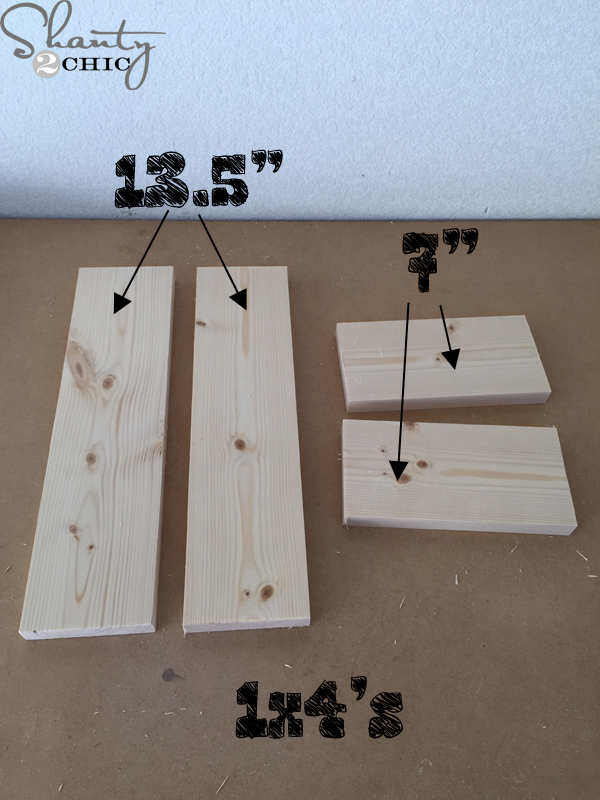 I cut two 1×4 pieces at 13 1/2″ and 2 1×4 pieces at 7″ (for each drawer). I used my 18-volt Airstrike to attach build the box. Attach the shorter boards to the longer boards with 1 1/4″ brad nails and wood glue. If you don’t have a nailer, you can use a hammer and finishing nails. Here is the frame of the drawer. Next, I cut a 1×6 at 13 1/2″ and fit it inside the frame and attached it with 1 1/4″ brad nails and wood glue. To finish it, I used one of our favorite distressing techniques! I started with one coat of Rust-Oleum Dark Walnut stain and applied it all over the drawers. I let it sit for 5 minutes then blended it with a clean cloth. Once the stain dried, I rubbed a very light amount of Vaseline to the corners, edges and everywhere that I wanted the stain to show through the paint. Then, I sprayed two coats of Rust-Oleum Heirloom White spray paint all over the drawers. (I did this immediately after applying the vaseline). When the paint dried, I used my Ryobi Job Plus (with an 80-grit sanding pad) to distress the drawers. The Vaseline makes this very easy and the paint will peel off where the vaseline was. You can also use sand paper for this part! 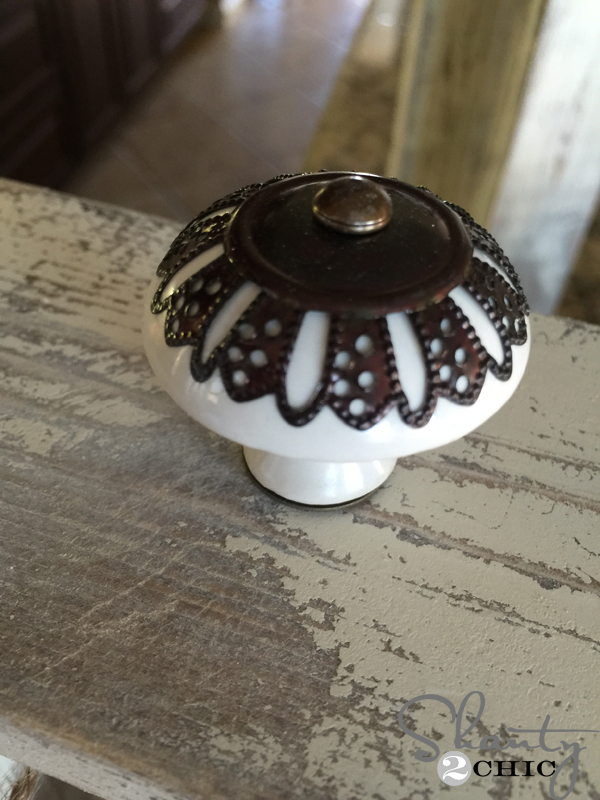 and added a cute knob! (found these at HomeGoods too)! I used jute to hang my ornaments. I just tied a bow to the knob screw and twisted the bolt on to keep it in place. oh my….what a great find!!!!!! Oh I love these! They are so pretty. I thought at first your ornament box was made from a vintage drawer. But no you had made it. It looks great! I love how it turned out. Thank you for sharing the tutorial for making these vintage boxes and your paint technique, I will have to give it a try. Pinning and sharing! I love this idea! Absolutely adorable! Pinning! Wow! I just bought four vintage sewing machine drawers at auction on Wednesday (similar to this photo)…without having a clue except that they’re beautiful. Now I know what I’m going to do! Thank you! Very do-able ornament display case. Thanks! One of the coolest ideas I’ve seen for drawers yet! Will be rummaging through mine, thanks! Absolutely adorable and always good to be reminded how to use these cute drawers in home decor even outside the holiday season so thank you for the plans! !